We have seen thus far that restitution is basic to God's law, its purpose being the restoration of godly order. This is a step towards the establishment of God's kingdom, begun as men and women are made new creations in Christ, and then furthered as they bring every area of life and thought into captivity to Christ. The greatest hurdle most people have when they attempt to apply God's Word to a social issue is their assumption about God's law itself. Quite simply, they often assume God's law is repressive and necessitates a denial of liberty. This perspective comes from a very non-Christian view of liberty. Never before in our history has it become more imperative for us, as American citizens, to do all in our power to maintain, increase, and optimize our liberty. Words, taken from Leviticus, are etched on the Liberty Bell in Philadelphia, Pennsylvania, reminding the people of America of the "liberty" to be secured "to ourselves and our posterity," as stated in the Preamble of the United States Constitution. Mel Gibson has portrayed many characters, but perhaps none so palatable to the American psyche as William Wallace in Braveheart. In his final scene, despite the pain and life-ebbing garrotting, Gibson manages to make the hills resound with his cry for "F-R-E-E-D-O-M!" Nearly every time there's a shooting anywhere in the country, the calls for more gun control get louder. The fact that slavery existed in a country like America, supposedly founded as a Christian nation, one where Scripture was used at times by Southerners to defend chattel slavery1 prior to the Civil War, is seen as evidence of the dangers that come from mixing religion with politics. Each new crisis in a nation's history seems to bring with it an expansion of the civil government. The crisis may be war, economic catastrophe, a natural disaster, or some other emergency. At the time, most people seem to see the increased power granted to the state as reasonable, even unavoidable. 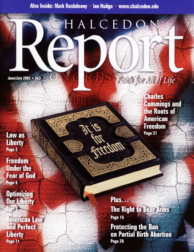 "Liberty" and "freedom" are words we as Americans, and especially as Christians, instinctively associate with patriotism and our unique heritage. But has patriotism become a mere cliché in the average American Christian's mind? In mid-March, 2003 the Senate finally ended the years-long battle over partial-birth abortion. With a surprisingly strong margin, 63-33, the Senate finally allowed passage of a ban on this gruesome procedure.